Lari Basilio was born into a musical household in São Paulo, Brazil. Her father is an accomplished singer and acoustic guitarist. One of her father’s songs had some intricate and very emotional guitar phrasing in it and it touched Lari in a deep way. From that point on, Lari wanted to learn all she could about playing guitar. After her father taught her a few chords on an acoustic guitar, Lari borrowed her youngest brother’s guitar. Her very first guitar of her own was a Stratocaster copy she bought with money she made from a part-time job. Lari Basilio DV Mark clinic in Mexico City. July 6, 2018, 12:49 p.m.
Brazilian guitar talent Lari Basilio will be in Mexico City on July 21st for a DV Mark clinic at Quality Guitar Auditorio Plaza Villa Jacinto, San Jacinto 16 - Àlvaro Oregòn (Ciudad de México). Welcome Lari Basilio! March 19, 2018, 11:28 a.m.
We’re happy and proud to announce Lari Basilio joined the DV Mark family! 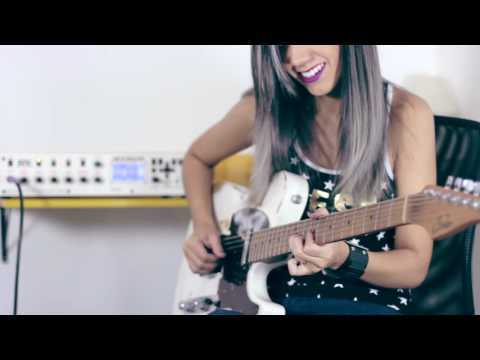 Lari is a very talented guitar player from Brazil who’s followed worldwide thanks to her amazing musicality, taste and technique.